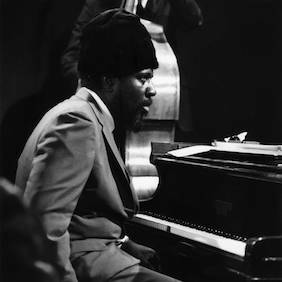 Born in Rocky Mount in North Carolina on October, 10, 1917, Thelonious Sphere Monk was only 5 when his family moved to Manhattan, in the San Juan Hill area. He started playing the piano at 6, and learned it largely by himself. As a teenager, he played the organ while his mother sang in a Baptist church. He would also perform on occasion with a trio in the neighboring bars. After touring for two years with an evangelist, he grew close to the NYC jazz scene and, in the early 1940s, became the designated pianist at Minton's Playhouse in Harlem. This is where he met the most important musicians of his time, amongst whom Kenny Clarke, Dizzy Gillespie, Bud Powell, and Charlie Parker. Night after night, the young virtuosos engaged in revolutionary conversation by means of free-flowing impro, and these seminal moments defined and created bebop. Monk developed his own original style, a synthesis of the great stride tradition embodied by James P. Johnson, of Art Tatum's paraphrastic art, and Duke Ellington's sophisticated minimalism. He started recording in 1944 alongside a great saxophonist – tenor Coleman Hawkins. But it was only in 1947 that he recorded his first A-sides under his own name, as part of a trio and a quintet for Blue Note – thus establishing his relentless originality as a composer. In 1951, his career came to an abrupt stop when he was charged with drug abuse and lost the work permit allowing him to perform in NYC clubs. He kept recording for Blue Note and Prestige (notably in a trio with bassist Oscar Pettiford and drummers Kenny Clarke or Art Blakey; but also with prestigious names, such as Sonny Rollins, Miles Davis and Max Roach...), he went to France for the first time in 1954, where he made his first solo recordings for Vogue, and met Baroness Nica de Koenigswarter, who became his lifelong friend and sponsor. In 1957, he was finally allowed to perform in NYC again, and his homecoming with John Coltrane at the Five Spot was highly praised; a while later he also played with Johnny Griffin and Roy Haynes. In 1959, he started a long and fruitful collaboration with tenor sax Charlie Rouse; they performed together until 1970. In 1962, Monk began recording for Columbia, and went on his first great European tour. A year later he toured Japan. His first Columbia record, “Monk's Dream”, became a bestseller, and he rose to stardom – in 1964, he was on the cover of Time magazine. He performed a lot, and many concerts were recorded, as testaments to his talent; yet in the 1960s Monk hardly composed – he preferred to focus on, and reinvent, the handful of brilliant original tracks he'd written in the early days. From 1970 onwards, Pat Patrick then Paul Jeffrey stepped in, replacing Rouse for a while, but Monk, who suffered many a psychotic breakdown, put an end to the quartet. In 1971, he agreed to take part in an All Star's Band European tour,with Dizzy Gillespie, Sonny Stitt, and Art Blakey (Giants of Jazz), with whom he recorded his last orchestral tracks. A few months later, in London, he made his final recordings (in solo and in a trio) for Black Lion, before he definitely withdrew into silence. He passed away on Feb. 17, 1982, at Baroness Nica de Koeningswarter's estate in Weehawken, New Jersey.